There is a permanent solution so that you can regain back your beautiful smile. 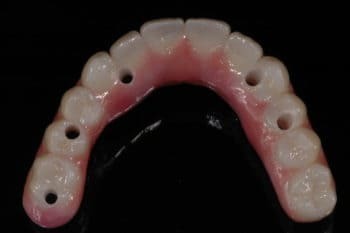 It’s a new innovation called a hybrid denture, and it allows for dental implants to hold onto a custom-made denture that fits permanently in your mouth. You may have better known this denture on television as the all on 4 denture. Basically what that means is that four dental implants are placed which help support permanent denture placement in your mouth. 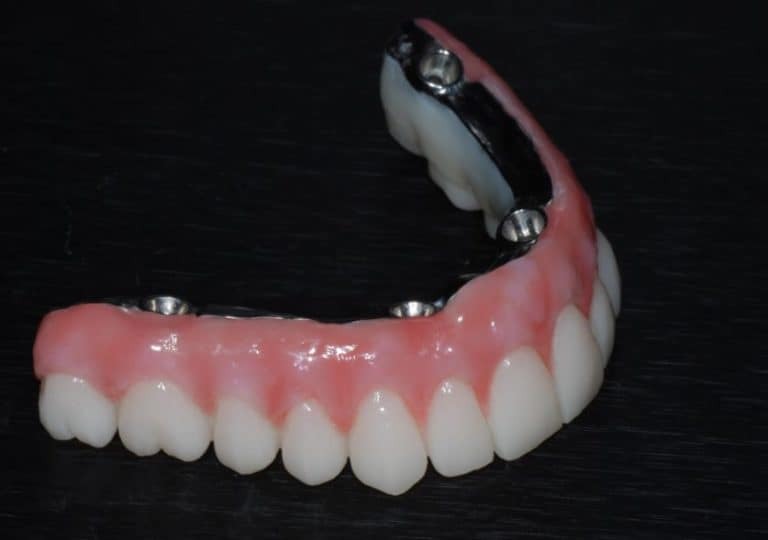 Below are some commonly asked questions about this new hybrid prosthesis. Please take some time and read. If you have any further questions, please contact our office today. A hybrid denture is a custom made denture that fits permanently into your mouth. It is not removal meaning, unlike a traditional denture, it will not be removed anytime during the day, even at night. What are hybrid dentures made of? These dentures are composed of either acrylic of Zirconia. Both fabrications make a fantastic final restoration, but the Zirconia dentures seem to be a lot more durable than their acrylic counterpart. How much do hybrid dentures cost? This cost for these dentures varies as each case has its variables such as: is bone grafting included, do we need to do any additional surgeries prior to dental implant placement, etc. During your consultation appointment Dr. Jasmine will sit down and formulate a complete and custom treatment plan just for you, and we will go over your options together. Typical costs can range from $10,000-$15,000 per arch. That’s is for one upper or one lower hybrid denture. How do I clean my hybrid dentures? A floss threader and a water pick will be needed everyday to remove any debris that get stuck between the denture and your gum tissue. Every three months, a mandatory maintenance exam is needed to make sure your denture remains pristine. During the appointment, Dr. Jasmine will remove and clean your denture, and make sure your tissues are cared for and healthy. Afterwards, the dentures is put back in place permanently, so that you can go about your day. Are all on 4 dental implants safe? They are very safe. The concept of the procedure is quite simple. Four dental implants are embedded in your jawbone, and a fixed permanent denture is constructed that is supported by these implants. Do I really get my teeth in one day? Yes you do. You will not get your permanent prosthesis on the day of implant placement, but you will get a temporary (or interim) denture that will also be permanently placed inside your mouth. 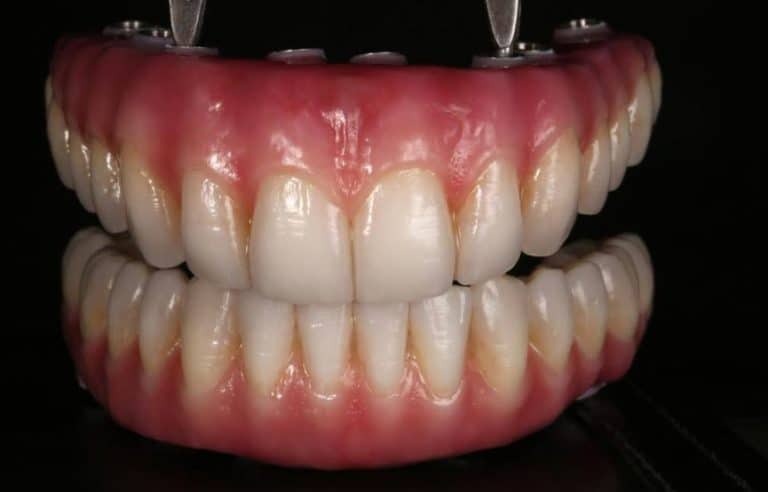 This interim denture will look very cosmetic and you will be thrilled with the result. What kind of foods can I eat after the all on 4 procedure? We recommend a soft diet for 2 weeks after the procedure. This includes potatoes, pasta, soft rice, and anything that doesn’t put too much pressure on your mouth. Are there financing solution available for all the all on 4 procedure? 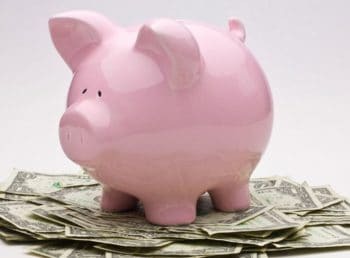 The most commonly used method for financing for our patients has been third party financing. We have teamed up with Green Sky financing solutions to offer you with an incredible solution to your finance questions. No impact on your credit score! We also have other third party financing companies that we work with, so that we do everything in our power to make sure that you get the treatment that you deserve. The all-on-4 dental implant concept is a proven long-term solution. The following was a study performed that shows how successful it really can be. A clinical study published in October 2014 in the Journal of Clinical and Diagnostic Research concluded a very high level of success in all on 4 therapy in both the upper and lower jaws. Does dental insurance cover the all-on-4 treatment concept? Yes it does. The great news is both dental and medical can cover a lot of your expenses. Depending on your plan and your carrier, a good amount of the procedure may be covered by your dental insurance plan. What makes Best Dental different than other traditional all on 4 centers? Reasonable cost: Our patients save upward to $10,000 on their treatment compared to other dental clinics offering the exact same treatment. IV conscious sedation is available in our clinic. We provide a all on 4 certified lab technician on site the day of your treatment. Computer guided surgery that helps us determine exactly where your implants need to be placed. This CT scan is a new state of the art technology that makes the whole treatment process proceed much more smoothly. What happens if my hybrid denture breaks or gets damaged? When a break or fractures occurs, you need immediate care to prevent further damage to the denture and your own mouth! In general, damage to your hybrid denture may worsen over time if you don’t see Dr. Jasmine to get it repaired. Additional fractures may occur costing your more money on repairs. At Best Dental, we will provide you with same day hybrid repair so you never go without missing teeth! This is our promise to you. What is the recovery time after all on 4 dental implant treatment? The recovery time is very minimal. Most people show signs of minor swelling for a few days, but with the medications you will be on (pain medications and antibiotics) your down time will be a few days at the most. Some of our patients go to work the very next day believe it or not! Dr. Jasmine will help determine whether a All on four Hybrid Denture is right for you. Come see why she is different that other Houston Dentists. Get the dental care that you deserve today! For more information, please call or visit our office to schedule a consultation today.